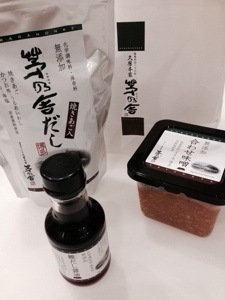 If you are interested in getting good stuff to make a great miso soup and other basic soups for Japanese cuisine, here is the recommended store — ‘Kayanoya‘ (they have a store at Roppongi Midtown and other locations). I have used fish powders (‘dashi‘) that comes in a bag, and this was good enough to turn a mediocre cook like me into a decent chef. But I discovered that the combination of their dashi and miso paste makes an instant miracle, and I was able to cheat on the cooking grade even higher. Since Kayanoya provides quality goods for a decent price, their gift package can be a good gift for friends and relatives.